Explore the innovative ideas that have made Anchor Wall Systems a leader in the concrete block retaining wall industry. Our landscaping blocks and retaining and freestanding wall systems combine long-lasting beauty and functionality with ease-of-installation. Anchor Wall creates and licenses a variety of aesthetic, easy-to-install concrete retaining wall blocks and freestanding wall systems. Anchor Wall is a concrete retaining wall block developer that licenses a variety of aesthetic, easy-to- install concrete retaining and freestanding wall systems. 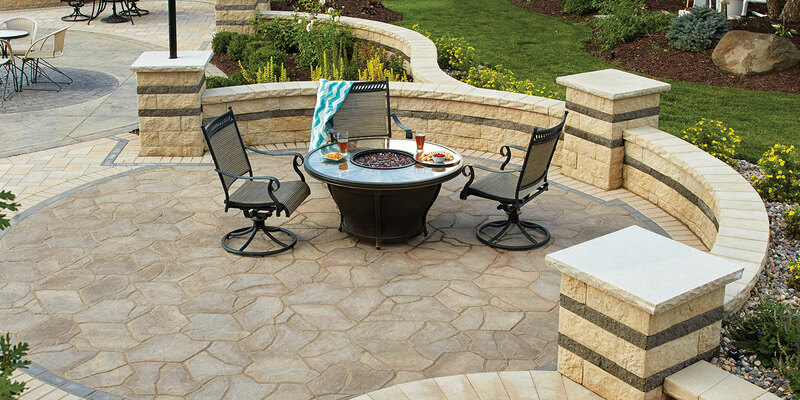 Find out who in your area carries Anchor Wall landscape blocks. Get the look of natural stone with the Brisa® retaining wall system. Smart landscaping transformed a large residential corner lot into a neighborhood delight. Terraced retaining walls transform a steep, dangerous slope. Achieve time-tested strength with the Diamond Pro® Retaining Wall System. Curved walls, a spacious patio and a water feature transform a backyard to an inviting space. New development uses 35,000 sq. ft. of Diamond Pro Stone Cut®. Emulate the appearance of hand-chiseled stone with the Natural Impressions ChiselWall® 4" x 12" retaining wall system. Dream backyard provides private space for entertaining.